Purist Audio Design is proud to introduce the Proteus Provectus line of cables. The original Proteus was a very popular line of our products. We decided to reintroduce the Proteus; however, this is by no means is the Proteus of old. The Proteus Provectus is a completely new design! The word “Provectus” is Latin for advanced, and that is exactly what this line of cables is! The Proteus Provectus uses a unique solid-core construction with our proprietary fluid shielding. Using this unique design, the cables provide amazing spatial depth, with a sweet top-end, and a very deep controlled bottom end. We designed this line of cables to fill the performance gap in between the Venustas and Fluid Dominus. 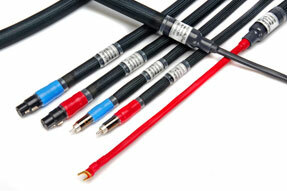 The Proteus Provectus line includes interconnects (single-ended and Balanced) and speaker cables (with a true bi-wire). The speaker cables are a four-cable set; with a separate positive and a separate negative cable per channel. The Proteus Provectus also uses Purist Audio Design's newly redesigned spades for a more secure fit. The cables come packaged in a handsome soft case.